Singing, Playing, Laughing and Reading and Writing, Of Course! 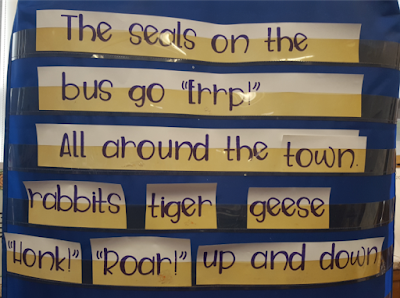 Back to School with "The Seals on the Bus!" 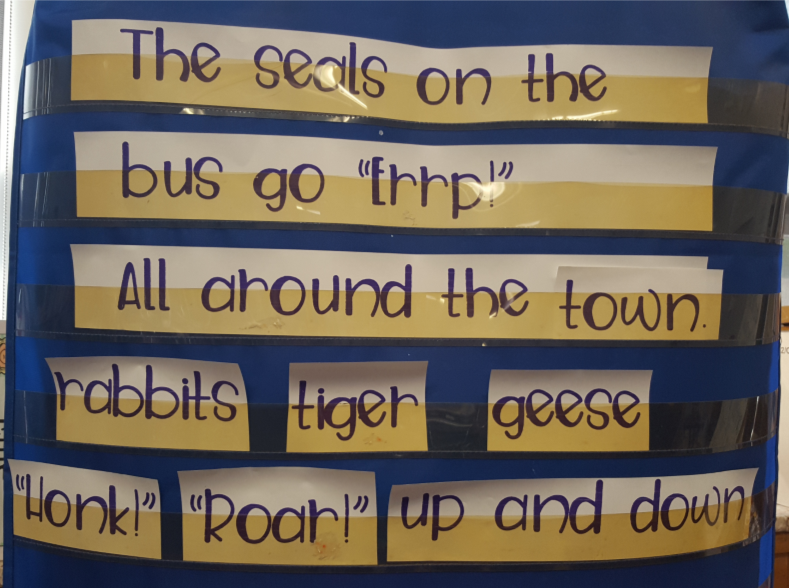 The Seals on the Bus makes a great mentor text for innovating on a language pattern (see another post I wrote about that process here). 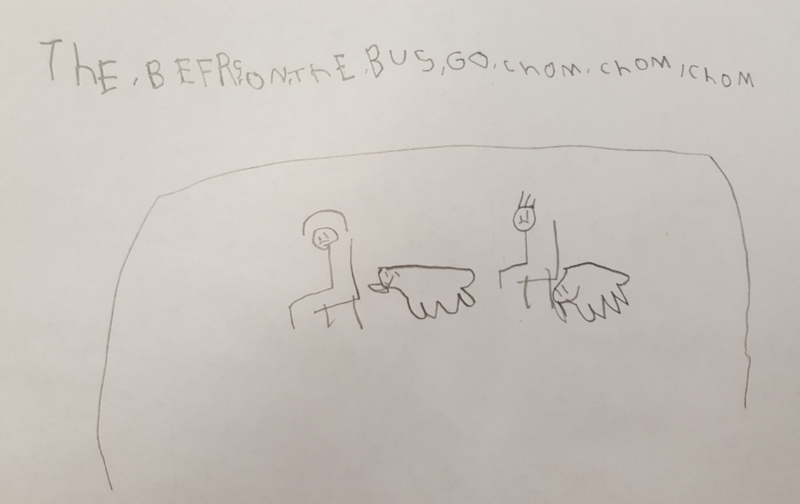 The text is based on the traditional "Wheels on the Bus," but instead of the story/song we know, all kinds of animals board the bus alongside the understandably nervous human passengers. It's great fun to read and sing the words in the book, for example: "The vipers on the bus go 'HISS, HISS, HISS! '...all around the town." K-2 students are highly engaged singing/reading, making the animal noises, and enjoying the details in the hilarious pictures (Watch out for those skunks!). Given the familiarity most children have with "The Wheels on the Bus," this is an ideal text for beginning the school year since students experience a high degree of success while reading. A logical extension of reading this book aloud (multiple times!) is interactive shared reading. In the packet I mentioned, I made word and sentence cards teachers can enlarge and use in a pocket chart. 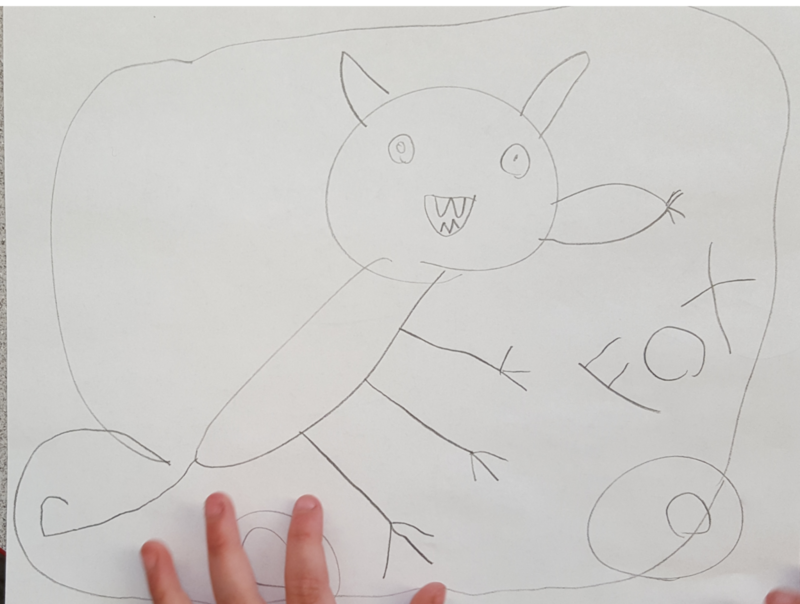 Then, as the class enjoys the text again, students can be prompted to use their phonemic awareness and phonics skills to find the correct words and substitute them on the chart as they move along in the text (as seen in the photos below). But, why stop there? As I read The Seals on the Bus this year, I was inspired to write a poem related to the book. I explained to students how this is Reader Response: sometimes you love something you've read so much, you just have to write about it. Or, something you read puts thoughts in your head that you'd simply like to write down and remember. Those are forms of reader response. The poem is pictured here and is included in the packet in both color and black and white versions. 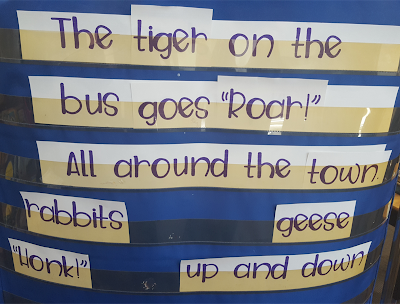 It could be enlarged for shared reading, and/or copies made to put in students' poetry folders for reading and rereading (We all know this a favorite way to build fluency!). "The beavers on the bus go 'chomp, chomp, chomp.'" No matter the grade, (kindergarten included!) I always invite students to "write more" if they'd like. After all, you never know what they might be inspired to do! 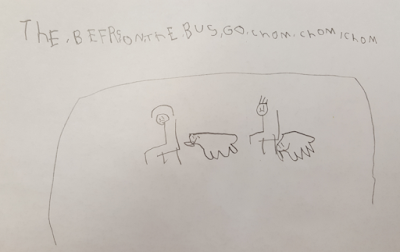 Some children may want to write their own individual books about animals on the bus or something else related to the reading. In any case, when students finish their writing, we always take time to share. I detailed ideas about sharing in the packet, along with bridging the reading to Shared and Interactive writing. Here's a link to a short video showing interactive writing in process, if you're not familiar with the technique. I plan to make additions to the downloadable (Get it here!) If you don't have a TPT account and would like a copy of the pdf, you can email me at janielwag@hotmail.com and I'll send it to you. 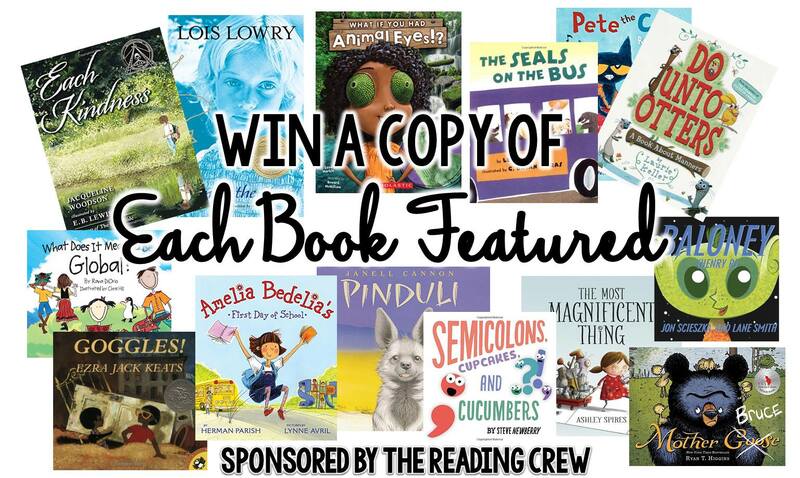 Follow the links in the link-up below to other blog posts by the literacy experts in The Reading Crew. Each contains a free downloadable that goes along with the Back To School Mentor Texts featured. AND, great news! 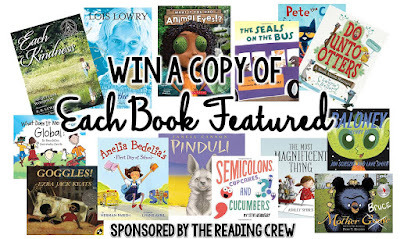 Enter the Rafflecopter below for chances to win a copy of every book featured in the posts! Entries accepted through next Friday. Finally, our link-up is supporting a "Go Fund Me" page for teachers from Texas who have experienced devastation from Hurricane Harvey. We hope you'll consider contributing to this "Teachers Helping Teachers" cause. Thank you and, as always, I welcome your comments and feedback. Have a happy reading/writing/thinking day! Great ideas and I your poem is so cute! I'm going to share the post with our kindergarten teacher. This book would be great for them and the reading activities are so easy to implement. Thanks! Thanks so much for stopping by! Thanks, too, for sharing the post! Janiel, the poem you wrote is adorable!! Thank you for introducing me to this book..I've never seen it before. CUTE! You are very welcome, Julie! I'm excited to check out your post, as well. I'm also very interested in the ideas you share on your Facebook page! This looks like so much fun! I love the step by step ideas and extension options. This was a new book to me, and it looks like a great one! It is a fun book for K-2, Carla! Looking forward to reading your post...going there now!